Finding an air quality solution for small areas isn’t always easy, as it can be a challenge to find a purifier that can fit in those spots and still be effective. 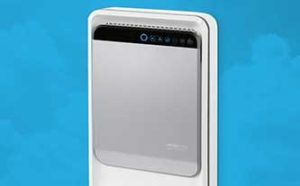 That’s why AeraMax Professional has expanded its commercial-grade air purifier offerings with the AeraMax Professional II, a slim, ADA-compliant model that cleans the air in areas 150 to 300 square feet. AeraMax Professional II was announced on March 22, 2016 at NFMT Baltimore and will officially go on sale June 21, 2016. The new model is specifically designed for small restrooms, exam rooms, offices and other common areas. Only 4 inches deep, AeraMax Professional II can be recessed into a wall, mounted on the wall or placed on a floor stand to seamlessly integrate into any space. Small rooms face the same air quality demands of large common areas, and can become quickly contaminated due to the limited space. Similar to AeraMax Professional’s other models, AeraMax Professional II removes up to 99.9 percent of airborne pollutants and uses EnviroSmart™ technology to optimize filter life and energy efficiency. Installing commercial air purifiers for your facilities, coupled with other indoor air quality initiatives, ensures better health and comfort for occupants, and reduces common complaints.